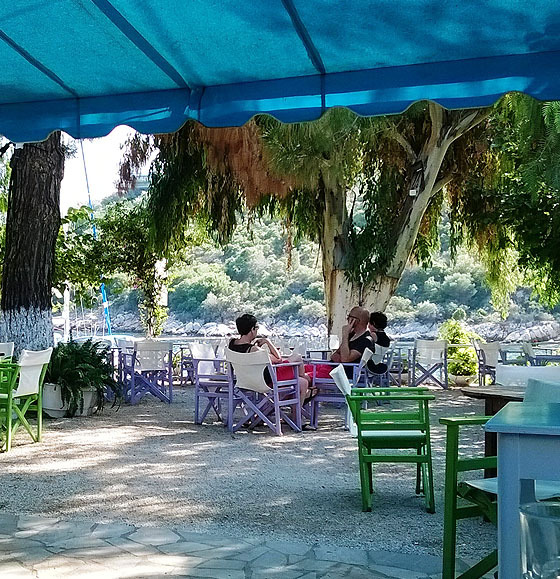 IKION Café – Bistro is situated in the picturesque harbor of Steni Vala.It is a place of serenity and relaxation for both Greeks and foreigners. Here, the smell of morning coffee blends with the scent of iodine, meeting with the hum of the cicadas. There are so many things one can enjoy in the evergreen bloomy garden! The aromatic coffee that goes with Mrs. Katina’s home made marmalade. The delicious light snacks, prepared by Mrs. Katina and made out of local Alonissos’ products, such as tuna, kritama, tzitzirafa, cheese or sour milk. Who could resist the homemade pizzas, the spaghetti, the fish or the meat prepared with Mediterranean temperament by IKION’s ever smiling and plethoric Italian cook Livio? A day could not be complete without a taste of Mrs. Katina’s traditional sweets. Any attempt to resist the nut pie with ice-cream or the galaktobureko (milk pie) will prove in vain! 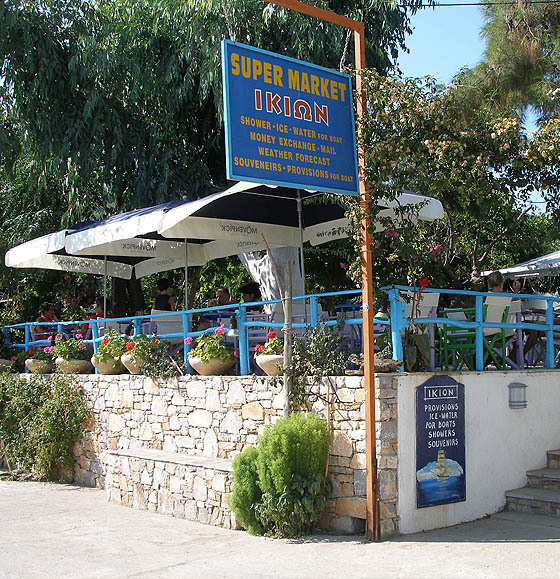 The grocery situated within the IKION complex will definitely impress you! from children’s toys, to pins, aspirins and cigarettes! Mr. Nikos can even bring you your newspaper! Those arriving in inflatable boats, sailboats and fishing boats (and not only them) may procure ice, water for the boat, enjoy a hot bath, or take a forecast for next day’s weather. You can find all these things at IKION’s beautiful grocery, where Kostakis is always eager to serve today’s customers and why not – tomorrow’s friends. Whether you are a visitor, a passer or a guest …. the grocery on IKION is ready to serve you! 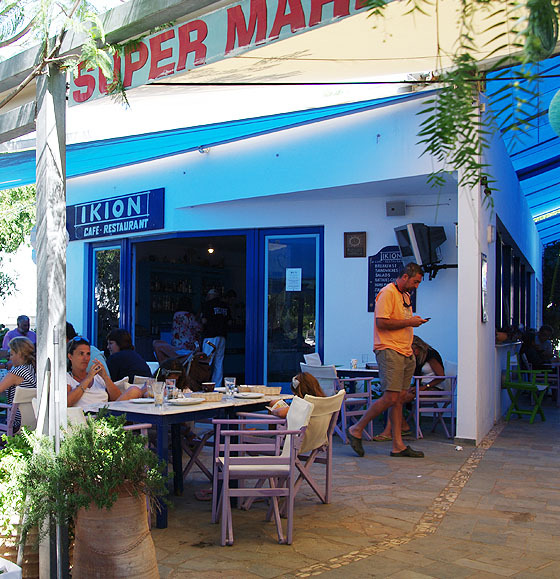 How could one leave Alonissos and Steni Vala without visiting the IKION giftshop? 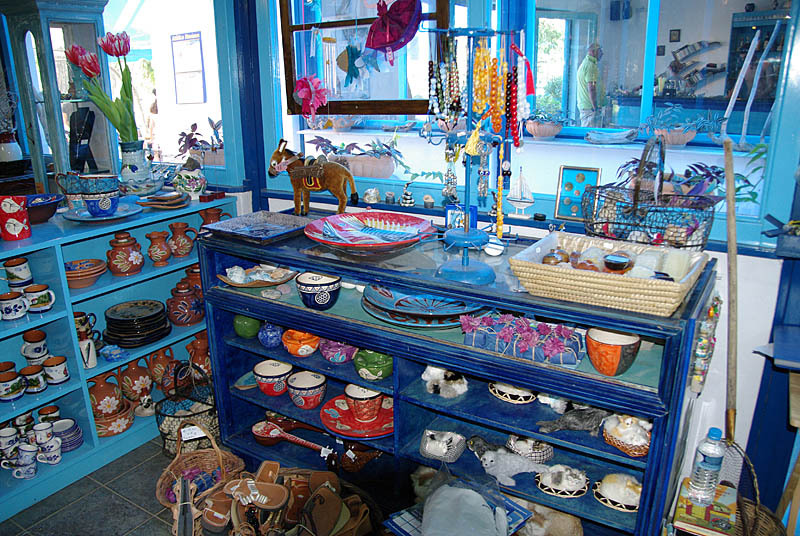 It is an exceptionally well looked after space with unique objects, chosen with love and taste from Harikleia, IKION’s owner, challenging the visitors to buy something to remind them of their vacation in this beautiful island. Diving and hovering in Alonissos’ deep blue is a challenging sensation. 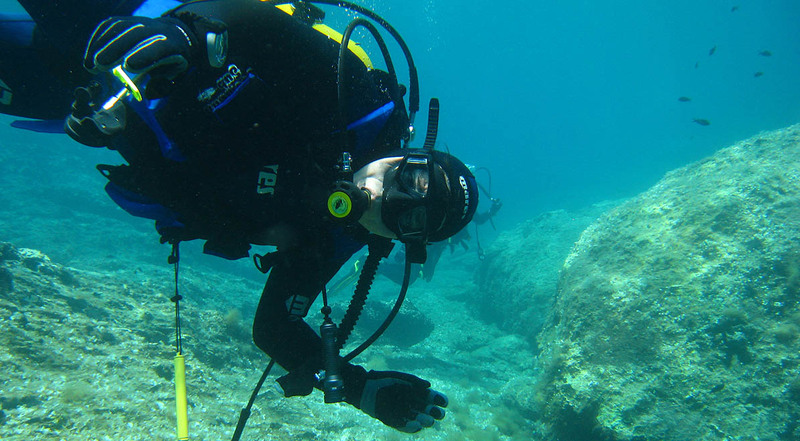 Scuba diving is gaining more and more fans in Greece, since apart for the thrill and amusement it gives, it can also bring you closer to the sea and to the natural environment. IKION DIVING can offer you diving’s experience, giving emphasis on security and on respecting the natural environment. Getting in touch with the water element and the submarine life is often a decisive experience. IKION DIVING at Alonissos’ STENI VALA can offer you this experience through unique underwater explorations of the sea of Alonissos. By completing 10 years of operation and longer IKION DIVING celebrates the successful developmentof a 5-star PADI diving center of the few in Greece.